This 100% cotton press cloth lets you see as you press. It absorbs moisture evenly, prevents,shine, and can be used with either a steam or dry iron. • Prevents shine on your fabrics. 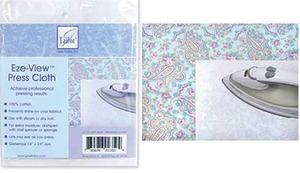 • Use with steam or dry iron. • For extra moisture, dampen with mist sprayer or sponge. • Lets you see as you press. • Generous 14” x 24” size.